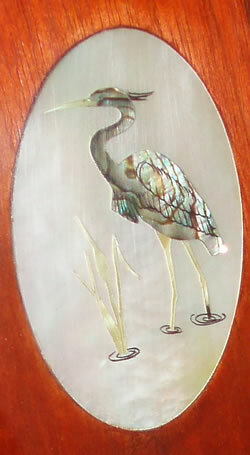 Blue Heron between 2 Single Vines ($1200) and between a Lotus inlay ($600). 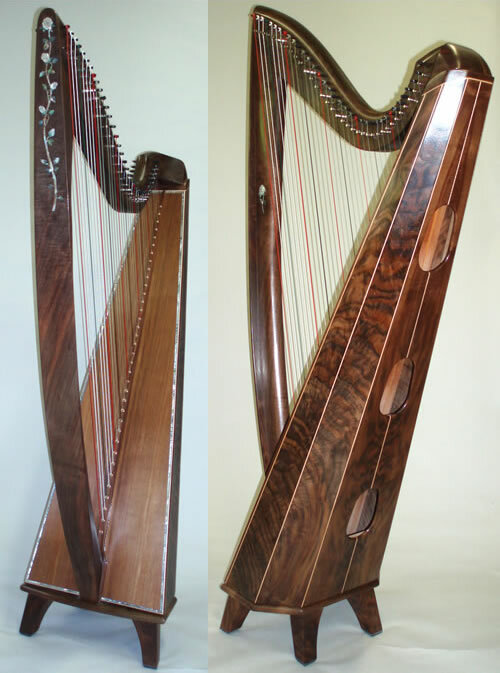 On the right is a larger version of the Lotus inlay ($350). 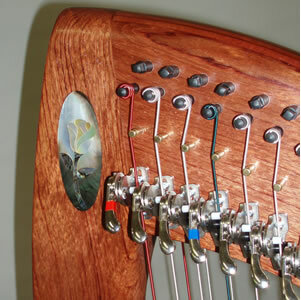 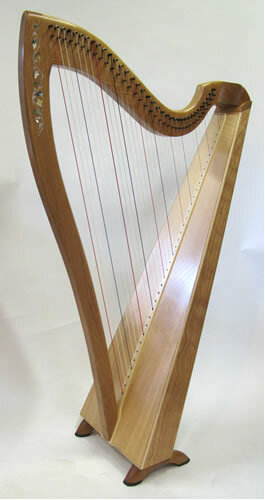 The Lotus has not been one of our regular inlays, but we have more lotus's that we can play with so let us know if you would like to explore this option on your harp. 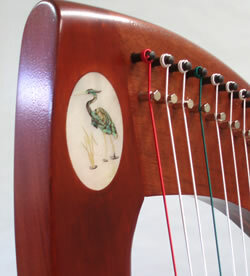 Yellow Oval Rose on the pillar of a Mahogany Swan ($250), and on a Walnut Swan on the right. 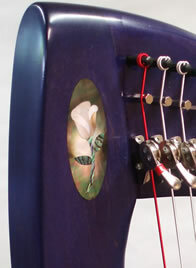 A Black Serenade with a white Oval Rose and an Indigo Serenade with a pink oval Rose ($250) and Rosewood trim ($100). 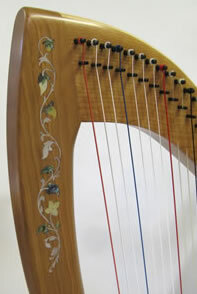 The Claddagh features two hands clasping, a heart, and a crown which correspond to the qualities of love (the heart), friendship (the hands), and loyalty (the crown). 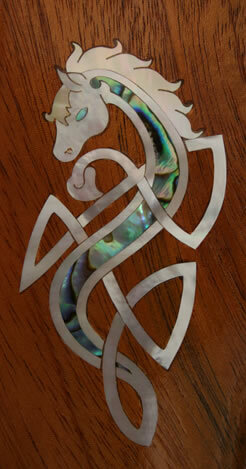 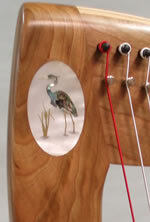 Below is a Cherry Swan with this inlay on the pillar. 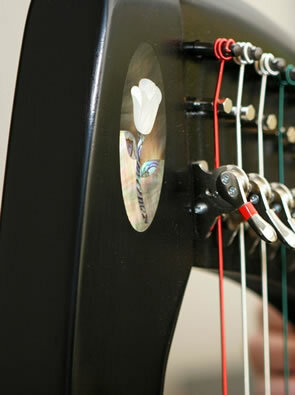 It will be even more beautiful as the cherry darkens. 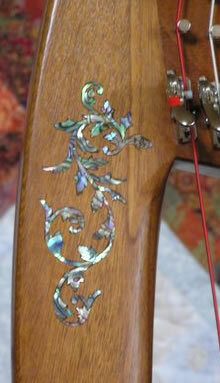 Blond Serenade with a Single Vine Inlay ($500). 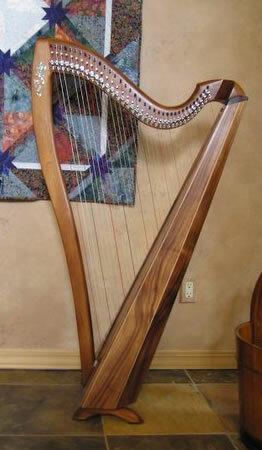 Mahogany Cygnet with a Double Vine Inlay ($900) and an Amber Ceili with a Triple Vine Inlay and a side "squiggle" ($1400). 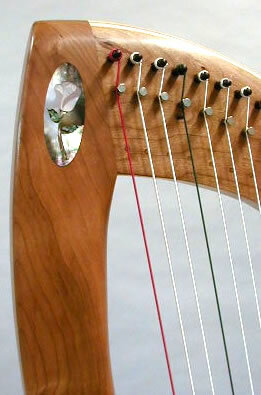 Dogwood Vine ($1150) on a Koa Ceili-Mor and a Rosewood Swan. 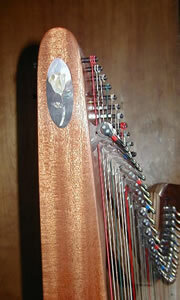 Both have soundboard inlay. 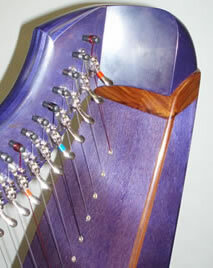 The Rosewood Swan also has Rosewood veneer. 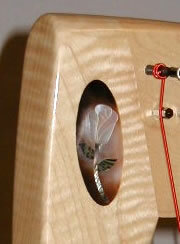 A Cherry Cygnet with the multi colored Dogwood down the side of the pillar. 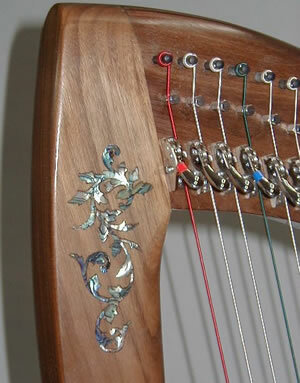 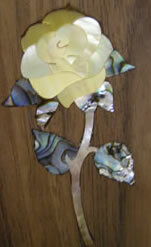 On the left, Walnut Swan with the yellow Rosebud inlay, in the middle, a white Rosebud inlay and on the right the Single Rose on the side of the pillar. 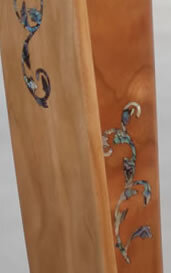 Bubinga Swan with Filagree inlay on the pillar ($2000) and a "squiggle" inlay on the side of the pillar ($400). 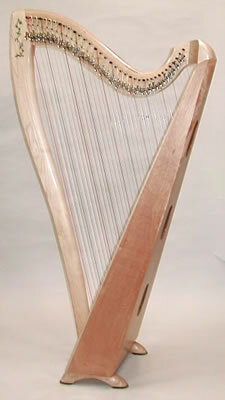 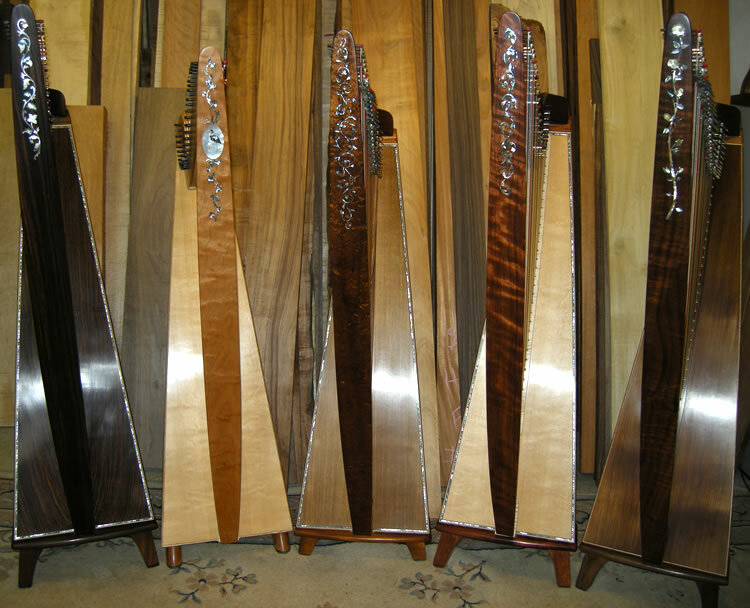 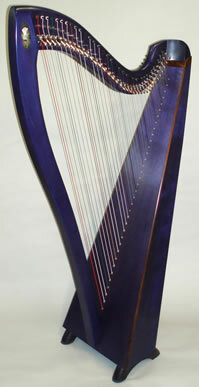 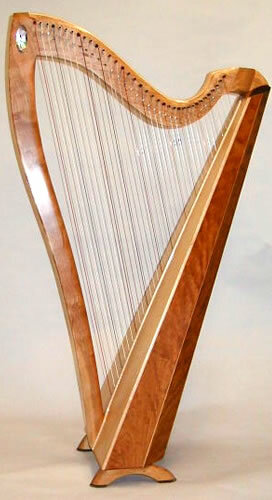 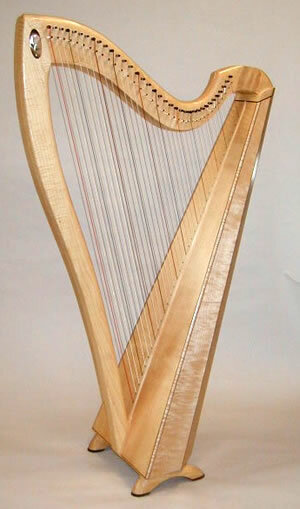 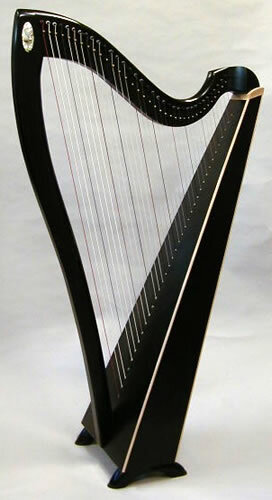 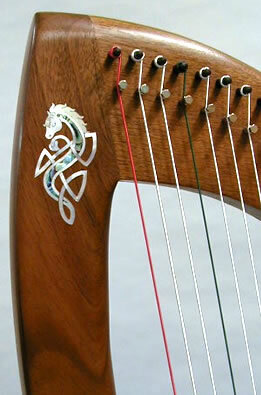 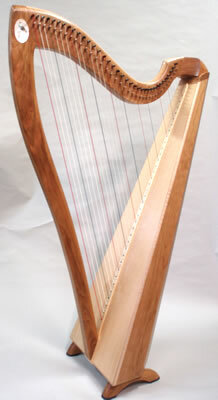 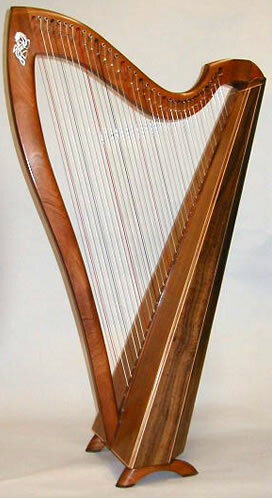 Never have we had so many gorgeous and intricate inlays in 1 batch of harps. 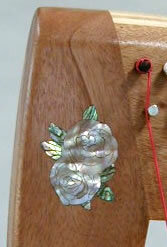 What you see above are 3 T-braces sitting on top of a soundbox inlaid with abalone trim. 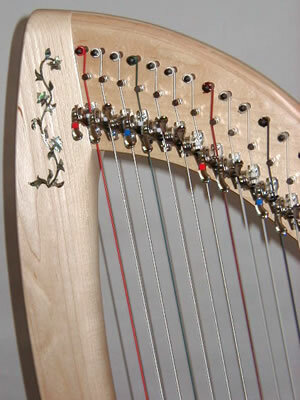 The t-braces are the front showpiece of the Swan. 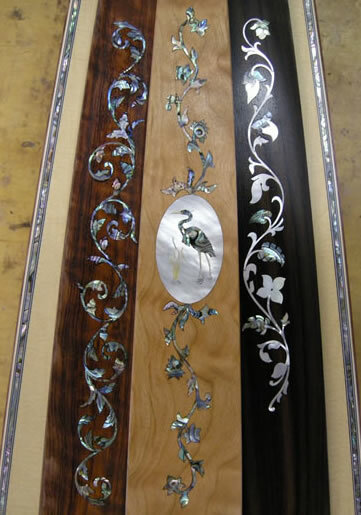 On the left is a Bubinga T-brace with a double Filagree Vine,, a Cherry t-brace with an Oval Blue Heron flanked by 2 Single Vine and on the right a Rosewood t-brace with a mulit-colored Dogwood Vine.